Back in December 1986 a group of us went to Sand Patch Grade, located in southern Pennsylvania. It is located on the former main line of the Baltimore & Ohio, but by the time we visited it was run by Chessie System (today it is part of CSX Transportation). Heavy trains heading west from Cumberland, Maryland, would need extra power for the run up the Allegheny Mountains, and after crossing into Pennsylvania they would stop at Hyndman to have locomotives added to the rear for a push. Hyndman had an operating signal tower, one of several still active along the old B&O, and the operators were generally friendly. On this particular evening, we parked in the employee parking lot for the tower, walked across a railroad bridge, and ascended the tower steps. We wanted to do night photos of the power stationed at Hyndman, and we knew our flashes would attract attention. The operator was understanding, and said there were no train movements in the area and sent us on our way. "When you're done," he said, "stop back here. We just got a new shipment of B&O baseball caps." 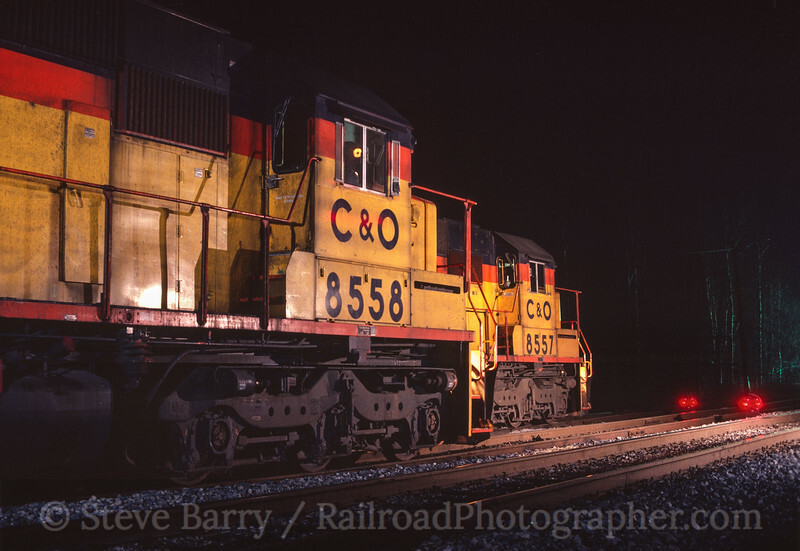 We took several night shots of the helpers, a pair of yellow SD50s (at the time these were big engines) and just as we were wrapping up I saw a set of headlights coming up the tracks from the east. Not a train headlight, but truck headlights from a rail/highway hybrid "hi-rail" truck. Now, even though we had gotten "permission" from the operator we were still technically trespassing (we weren't even supposed to go in the tower), and I hoped no one in charge was in the truck or we could be in a heap of trouble. We moved our tripods off the tracks and the truck rolled up and stopped next to us. Much to my dismay, a guy in a white hard hat -- a supervisor -- was in the truck. We were in trouble. "Hey, you guys," he yelled out the window. "When you get finished taking pictures, go up in the tower. We just got a new shipment of B&O baseball caps if you want to buy one." And with that he was gone. 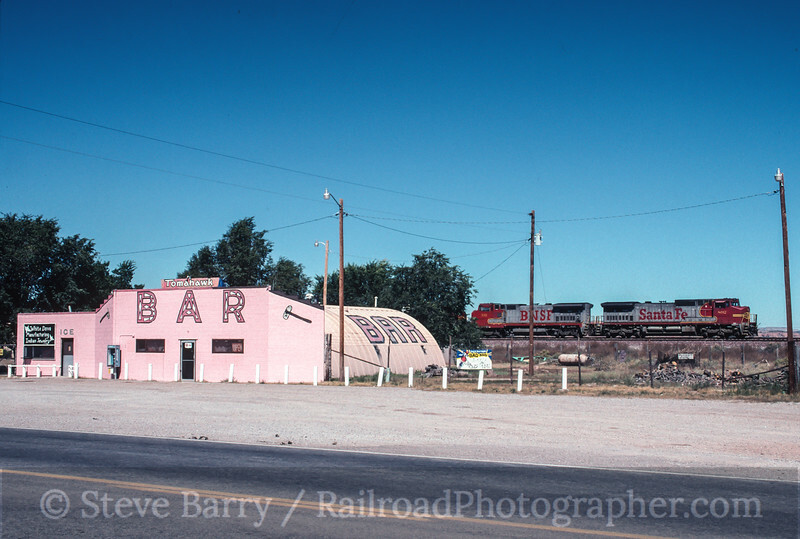 In 1999 I was in New Mexico following the former Santa Fe transcontinental main line across the desert (at the time of the trip it was known as the Burlington Northern & Santa Fe, and since has become simply BNSF Railway). I was with a group of friends, and it soon became apparent that we had different shooting goals. They wanted to wait by the tracks and shoot every train that came by in the standard three-quarter wedge shot, then move when there was a break in the action. The problem is, the Santa Fe is one hopping railroad, and breaks in the action are few and far between. Meanwhile, we were in the heart of The Mother Road country, along historic Route 66, and I wanted to pull back from the tracks a bit and get some iconic Route 66 imagery into the scene. It became readily apparent that sticking with them was going to result in getting a dozen trains in the exact same location from the exact same wedgie angle. But they are friends, so I decided to hang with them. Finally there was a break in the action and we decided to move. I was in my own car and pulled away first, looking for a new angle. Their driver was slower, and soon some cars separated us. Finally, I saw a shot I wanted and pulled off the interstate -- but they missed me turning! In this time before cell phones I had no way to get ahold of them, and a futile attempt to get back on the interstate to catch them didn't work (okay, maybe I didn't try all that hard). But suddenly I was alone and free to make my own decisions. I set up at the Tomahawk Bar in Prewitt for a shot (something none of the rest would have even considered) and captured several more away-from-the-tracks angles along Route 66. I didn't catch up with the gang again until we hit our reserved motel later that evening. They caught about 30 trains during the day from about three locations. I caught far fewer, but quantity isn't the name of the game. On this day, I was in a non-wedge zone.